Gov. Susana Martinez holds a post session press conference, March 18, 2017. Photo by Trip Jennings. New Mexico lawmakers passed 277 bills in this year’s 2017 session, but Gov. 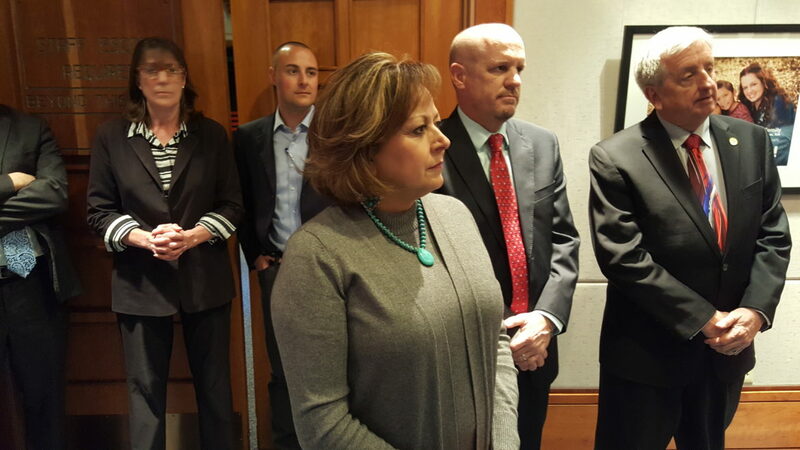 Susana Martinez vetoed more than half of them. Democrats, particularly Senate Democrats, were the most frequent veto victims. Overall, Martinez vetoed 60 percent of the 172 bills sponsored solely by Democrats. She signed nearly 72 percent of the 60 bills sponsored solely by Republicans. And she approved nearly 58 percent of the 45 bills with bipartisan sponsorship. House Republicans saw 78 percent of the 32 bills they passed become law, the highest success rate. The 28 House bills with bipartisan sponsorship had a success rate of 75 percent. But only 43 percent of House Democrats’ 77 passed bills became law. The Republican governor vetoed 71 percent of the 17 Senate bills with bipartisan sponsorship and 63 percent of the 95 bills sponsored solely by Democrats. But Senate Republicans saw 64 percent of their 28 bills become law. Of the 112 lawmakers, 85 were listed as the lead sponsor on the 277 bills approved. Among the top 10 lawmakers in terms of numbers of bills, Sen. Gay Kernan, R-Hobbs, saw seven of the nine bills she passed signed. On the other hand, Senate President Mary Kay Papen, D-Las Cruces, saw only one of her nine bills become law. Four of those on the top 10 list are in legislative leadership. In addition to Papen, they include Senate Majority Whip Michael Padilla, Senate Majority Leader Peter Wirth and House Majority Leader Sheryl Williams Stapleton. New Mexico In Depth compiled data from the New Mexico Legislature’s website and cross-checked it with the Secretary of State’s enrolled bills, as well as the governor’s office list of actions on Senate and House bills. A downloadable spreadsheet of the data is here. One significant difference is eight Senate and two House bills are listed by the Legislature as approved, but listed by the governor’s office as vetoed. The Secretary of State also didn’t enroll the bills. But House and Senate Democrats say Martinez violated the law by not including a message on why she vetoed the bills during the session. They’ve said they’ll challenge those vetoes in court, though no action has been filed. New Mexico’s 2018 election season is off to a fast start when it comes to campaign cash. Candidates reported raising $1.8 million in reports filed Monday, with nearly half that raised by Democratic gubernatorial candidate U.S. Rep. Michelle Lujan Grisham.